When you�re thinking about lowering your vehicle, you should consider B&G lowering springs. B&G sport lowering springs are engineered to improve handling while maintaining the safety and ride quality of your vehicle. With B&G lowering springs, you�ll also get the aggressive look you�re searching for. 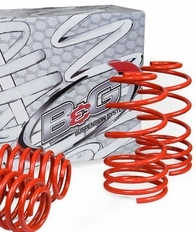 We�re proud to have B&G lowering springs here at New Level Motor Sports because they have all of the features that discriminating vehicle enthusiasts are looking for. In addition to their superior quality, B&G sport lowering springs come with a lifetime warranty. Take the time to look through our selection of B&G lowering springs to find the ones that are perfect for your vehicle. Here at New Level Motor Sports, we guarantee the lowest price on all B&G products. That means if you find a better price somewhere else, we�ll match or beat the price. We want to make sure that you have the ride of your dreams�with B&G lowering springs, that�s totally possible.